Has Austin’s public transportation planning and decisionmaking establishment turned a new leaf? That’s yet to be fully determined. But … if Project Connect – the Capital Metro-sponsored major planning effort in charge of evaluating possible rail and other forms of “high-capacity transit” – offers any indication … there may be signs of a changed focus. 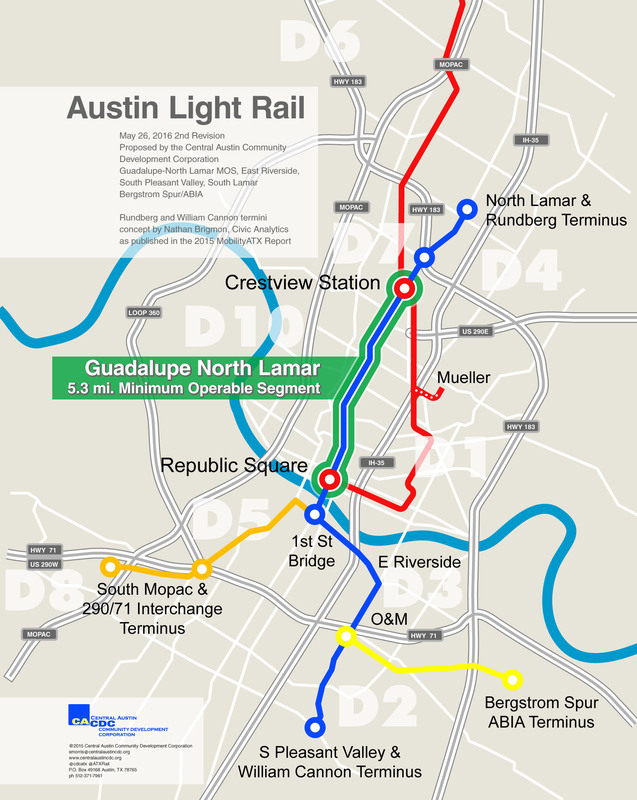 The original Project Connect earned intense distrust from Austin’s most ardent transit advocates because of its role leading the 2013-2014 High-Capacity Transit study that produced the disastrously flawed $600 million Highland-Riverside urban rail proposal (defeated by voters in November 2014). In contrast, the current planning agency (“Project Connect 2.0”) appears to have actually undergone a makeover in some important respects. • Personnel — A totally new planning team, with completely different personnel from the original Project Connect. • Consultants — A new consultant team led by AECOM. • Methodology — A focus on actual travel corridors rather than the original Project Connect study’s method of slicing up central Austin into districts and sectors and mislabeling them “corridors” and “subcorridors” … plus analytics that seem more accurate in evaluating and prioritizing corridors for a comprehensive plan. • Public involvement — What seems to be a much more sincere effort than in the past to solicit and engage actual involvement by key members of the community in the nuts and bolts of the planning process. 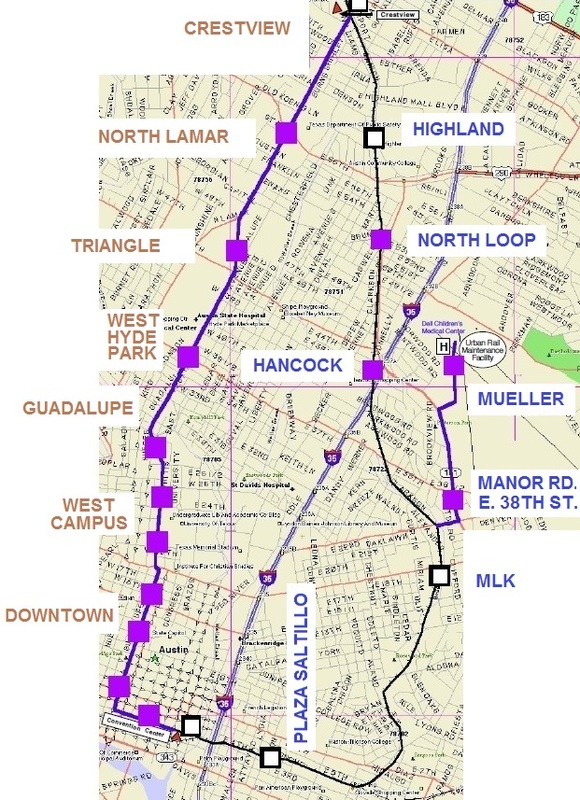 Included in this outreach have been strong advocates of urban rail for the Guadalupe-Lamar corridor. Invited to an April 17th consultory meeting, representatives of the Texas Association for Public Transportation (TAPT, sponsor of the Light Rail Now Project and this website) and the Central Austin Community Development Corporation (CACDC) were presented an overview of Project Connect’s planning process and its current status, which appeared to represent a new direction in goals and methodology and a somewhat new approach to public involvement. 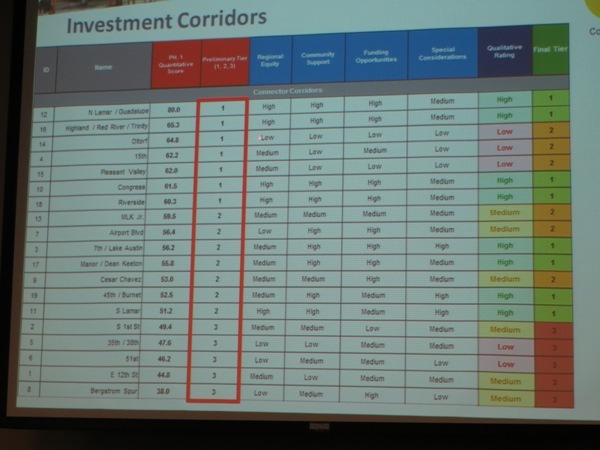 Currently Project Connect is completing what it designates as Phase 1 of its overall analysis – concentrating mainly on evaluating and selecting corridors as candidates for possible “high-capacity transit”. Phase 2, according to the agency, about to begin, will focus on selecting modes (i.e., types of “vehicle” systems), identifying funding mechanisms, determining “the best set of solutions”, and recommending Locally Preferred Alternatives (LPAs). 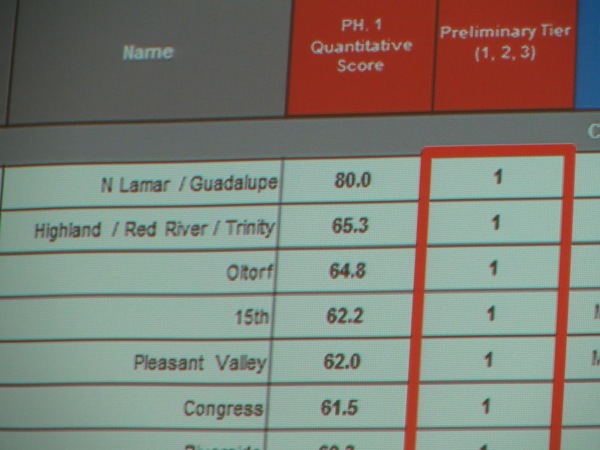 At the April 17th meeting, the attendees were told that the Guadalupe-Lamar corridor was ranking quite high in the evaluation. They were encouraged to attend a public meeting of the Multimodal Community Advisory Committee (MCAC), set for April 26th, where the major results of Phase 1 would be presented. From here, according to the study timetable, the focus will narrow on possible modes (rail modes, buses, others) and comparative costs. 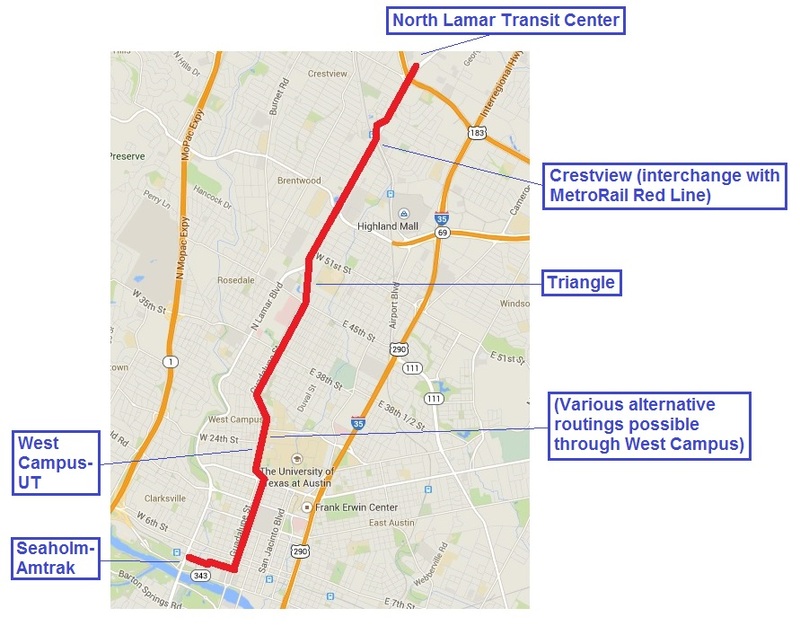 Obviously, there’s no guarantee that light rail transit (LRT) on Guadalupe-Lamar – the center of substantial community interest for decades – will make the final cut. Nevertheless, despite an array of critical differences, study methodologies and planning models frequently treat rail and bus modes as if they’re totally interchangeable in key features such as attracting ridership, accommodating future ridership growth, and stimulating economic development. So will an adequate, fair, accurate comparison be conducted? Are local public transport planners actually starting to move in a new direction? The jury’s still out. But Austin’s staunchest transit advocates are watching … and hoping. Putting Guadalamar into the second ‘group’ of study items is clearly an attempt to justify low-capital projects (high-capital projects being reserved for the first group, i.e. ‘commuter projects’). I expect rapid bus to remain the ‘high capacity solution’ given that. Mike, you are right to be concerned about the segregation between “connector” and “commuter” corridors. Whether Project Connect’s current study will go in the direction you predict remains to be seen. Of course, we’ve had similar concerns about the differentiation of “connector” and “commuter” corridors, but community members of the MCAC tell us the “connector” corridors are more in line with local urban rail as opposed to regional rail for the “commuter” corridors. This differentiation however has not been apparent in cities like Dallas (DART), St. Louis, Denver, San Diego, etc. where light rail transit performs in both roles. Project Connect’s methodology does have its problems, and we don’t intend to abandon a careful vigilance of this process. Your input and feedback are very valuable.